Server reinforcements and tweaks are coming soon, but the auction house will take a little longer. So, as expected, Diablo III launched with all the beauty and grace of a wildebeest careering over a cliff. Those players who managed to make it past the game's login screen and its notorious "Error 37" - which countless Twitter japesters have labeled the game's first boss - were dismayed to find that the game suffered from performance problems and at least one game breaking bug. As a result, Blizzard has delayed the release of the game's real-money auction house. The company also issued an apology that was only a tiny bit self-gratifying. This was posted on the official Diablo III forums. To that end, we'd also like to say that we've been humbled by your enthusiasm - and we sincerely regret that your crusade to bring down the Lord of Terror was thwarted not by mobs of demons, but by mortal infrastructure. As many of you are aware, technical issues occurring within hours after the game's launch led to players experiencing error messages and difficulty logging in. These issues cropped up again last night for the Americas and Europe servers. Despite very aggressive projections, our preparations for the launch of the game did not go far enough. 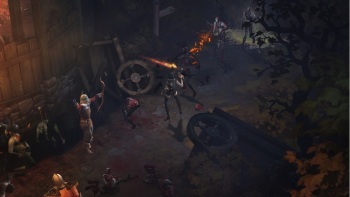 I don't think anyone expected Diablo III's launch to go off without a hitch - I can count the number of online games that have launched without being at least partially broken on the fingers on one foot - but, in case you missed the bleating, numerous players have picked up Diablo III for its single player content. The merits of requiring a constant internet connection for single player games are still up for debate, but I don't think its unreasonable for gamers to expect that if you require them to log into a server to play the game they just purchased for $60 then that server should actually work.